"Izvestiya Akademii nauk SSSR. 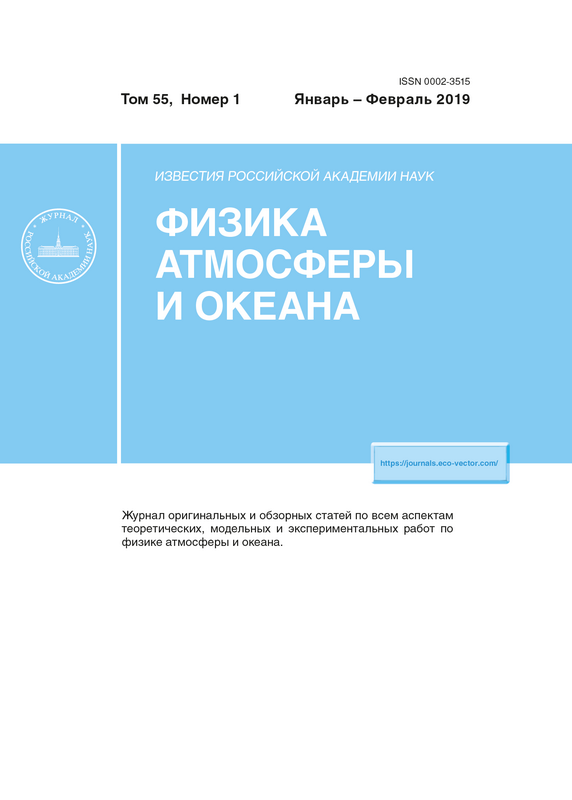 Fizika atmosfery i okeana" is a journal that publishes original scientific research and review articles on vital issues in the physics of the Earth’s atmosphere and hydrosphere and climate theory. The journal presents results of recent studies of physical processes in the atmosphere and ocean that control climate, weather, and their changes. These studies have possible practical applications. The journal also gives room to the discussion of results obtained in theoretical and experimental studies in various fields of oceanic and atmospheric physics, such as the dynamics of gas and water media, interaction of the atmosphere with the ocean and land surfaces, turbulence theory, heat balance and radiation processes, remote sensing and optics of both media, natural and man-induced climate changes, and the state of the atmosphere and ocean. The journal publishes papers on research techniques used in both media, current scientific information on domestic and foreign events in the physics of the atmosphere and ocean. Eliseev A.V., Zhang M., Gizatullin R.D., Altukhova A.V., Perevedentsev Y.P., Skorokhod A.I. Timofeyev Y.M., Berezin I.A., Virolainen Y.A., Makarova M.V., Polyakov A.V., Poberovsky A.V., Filippov N.N., Foka S.C.
Perepelkin V.G., Chunchuzov I.P., Kulichkov S.N., Popov O.E., Repina I.A. Bondur V.G., Serebryany A.N., Zamshin V.V., Tarasov L.L., Khimchenko E.E. Stepanenko V.M., Repina I.A., Ganbat G., Davaa G.